Deposit Methods VISA, Mastercard, Neteller, Eco, Skrill, Entropay, Paysafecard. Royal Vegas offers free pokies for Australians with no real money deposits. We are not sure of the exact date Royal Vegas was launched, but what we do know is that it has a great stature in the online casino world and has won awards for its customer service. Royal Vegas nestles neatly into the Fortune Lounge Group of online casinos and has a strong and respected reputation because of this. Recently due to certain legal issues and new gambling ammendment bill Aussie players can no longer play real pokies here but can enjoy free pokies for fun at their fun casino with free credits and bonuses. Royal Vegas prides itself on being powered by Microgaming, the online casino software company who Royal Vegas see as “the world-leader in online gaming software development” so you will find awesome pokies from this developer to enjoy. How to play at Royal Vegas Fun Casino? 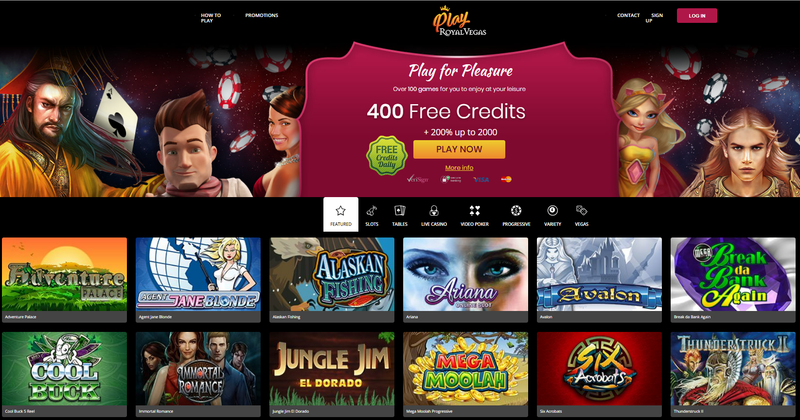 All you need to do is visit Royal Vegas fun casino on your mobile, PC or tablet by just typing the URL of the casino https://www.playroyalvegas.com/ on your web or mobile browser be it chrome or safari. If you agree with the terms and conditions, click Create My Account. You’ll receive an email confirming your registration. Remember when you win you receive more free credits in the form of virtual currency automatically deposited on your casino account to play more. No real money is involved here. When you join the casino for the first time you are offered 400 free credits to play. Also you get 200% up to 2000 match bonus to play pokies all free. You can acquire more free credits. Play the games and level up (there are over 200 levels) and you get free bonus to play. As your experience level grows, you get to unlock hidden promotions and stand a chance to gain access to our exclusive invite-only special offers. Note that the above promotions are subject to terms and conditions and that credits cannot be withdrawn. Play Royal Vegas is a fun-play, token-based casino only and does not offer real money gameplay. As no real money is involved to play pokies the question of payment methods doesn’t arise. For purchasing more free credits you can use credit cards, e wallets, bank transfers. Paypal is not accepted at this casino. Like any other regular online casino, Royal Vegas fun casino also offers 24.7 help support in case you need to clarify any doubt. You can email at support@funplaysupport.com or have a live chat.